The Indian government has rightly rested its Digital India initiative on a series of measures to liberalise the economy. One of those measures of free-market wisdom, however, the usual government-cheering section suddenly seems to be irrationally against. The PMO will be receiving from the Department of Industrial Policy and Promotion (DIPP) on April 30 a report on the Patent Office’s Computer-Related Inventions Guidelines (CRI), in which parties who usually applaud free-market measures are horrified to discover that Section 3(k) of the Patent Act really does prohibit government-awarded monopolies in software, and that the controller of patents is implementing the statutory command. Software patenting is not a requirement of TRIPs, or of any current international trade law. The controller’s new CRI guidelines actually implement a test for software per se — unpatentable owing to Section 3(k) — which is close to the "machine or transformation" test all-but-imposed by the US Supreme Court in a series of cases over the last five years, in all of which we were amici curiae, urging the court in its current direction. 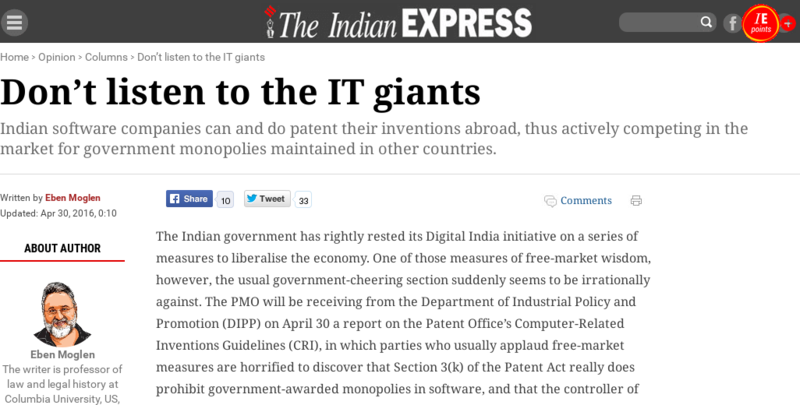 Software patenting is not in the Indian national economic interest. "Software," as Bill Gates used to say, "is an IQ business". When non-Indian firms can get software patents in India, the effect is to hobble the Indian IQ advantage, by making what many talented Indian programmers could otherwise use to make new innovations in software the property of the non-Indian patenting company. As our organisation, SFLC.in, has shown in its research report on the subject, more than 90 per cent of software patents awarded in India, before the rectification imposed by the new guidelines, were issued to foreign corporates. Indian software companies can and do patent their inventions abroad, thus actively competing in the market for government monopolies maintained in other countries. But as the US Supreme Court has moved the US patent system away from patenting pure software claims and software-enabled business method claims, permitting such claims to be perfected in India awards the US and other non-Indian companies an unfair advantage here. The persistent US unfairness found in the Super 301 designation, alleging supposed inadequacy in Indian "protection" of "intellectual property", is also clearly expressed in current demands by US industrial parties — softly but unmistakably backed by their government — that India reverse a course converging with the US’s own. In the Regional Comprehensive Economic Partnership (RCEP) negotiations, too, Indian efforts to implement its own longstanding patent law, preventing foreign parties from using the patent system to hobble Indian advantages in software-making, have come under direct fire. Language proposed by the Japanese government would require India to repeal the CRI guidelines and modify or abandon Section 3(k), which makes algorithms and software per se unpatentable. Software industry incumbents, including TCS and a sprinkling of other Indian firms among the phalanx of US giants, have been forecasting doom if the Patent Act is actually observed. Along with patent lawyers — to whom no limits on the applicability of patent law are ever welcome — they have been announcing the death of Digital India, unless they are instantly allowed to own it. But as many IIT luminaries and dozens of start-up entrepreneurs have publicly indicated to the Indian government in refutation of this chatter, the most important barrier to the growth of the burgeoning internet economy’s dynamic, inventive small firms is the uncertainty for potential investors caused by the possibility of patent attacks by incumbents against new market entrants. Patent law is supposed to provide a limited-term commercial monopoly in return for the disclosure of inventions that would, in the absence of patent availability, be kept secret. This "bargain" has never made analytic sense for inventions made entirely of computer software. The idea of "free software", made by massive collaboration under rules allowing everyone to learn, understand, improve and share, has transformed the global software industry. Disclosure is now an inherent part of the process by which progress occurs, as it is in fundamental research in physics, chemistry or any other natural science. Patenting software makes no more sense than patenting mathematics, which is why the Patent Act Section 3(k) says what it does. 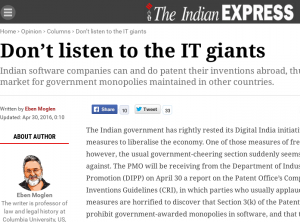 Patenting software is no more a part of the Digital India future than is patenting arithmetic. The government will wisely pay no heed to the blandishments of the incumbents. This article was written by Prof. Eben Moglen for The Indian Express, published on April 30, 2016.